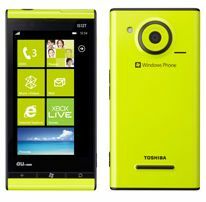 Fujitsu Toshiba Mobile Communications has launched IS12T, the first smartphone to run Windows Phone 7.5 in Japan. The mobile phone comes with water and dust resistant technology and will be available through KDDI Corporation (a Japanese telecom operator) and Okinawa Cellular. The mobile phone has a 3.7 inch TFT color LCD display screen (480x800 pixels resolution) and it employs panoramic screens called "hubs" that provide the users with access to the information they want by simply scrolling sideways. The different hubs available include the 'People Hub' (which brings address book data and social media updates from designated contacts together), 'Music + Videos Hub' for enjoying music and 'Pictures Hub' for viewing and sharing photos. Additionally the smartphone can read and edit files from PC editions of Microsoft Office 2003, 2007 and Office 2010 and they can also access Microsoft's free Windows Live SkyDrive cloud service which allows them to store and share up to 25GB of data. The in built memory of the device is 32GB. The smartphone comes with an amazing 13.2 megapixel camera that can capture high resolution still images (using the Milbeaut Mobile image-processing engine) and video footage. It has Wi-Fi, Bluetooth, FM radio and supports both CDMA and GSM networks. The pre-installed apps include LinkCabinet, which enables the use of DLNA functions; NAVITIME, a comprehensive navigation application and GREE, which enables the use of social networking functions. The dimensions of the device are 118mm x 59mm x 10.6mm and it weighs at 113 grams. The company claims the battery will provide 6 and a half hours of talk time and 280 hours of stand by time and the mobile phone comes in Citrus, Magenta and Black colours. Fujitsu is hardly a name to reckon with in Indian mobile handsets business and neither KDDI nor Okinawa Cellular has a presence in India. This means that one of the ways the handset comes to India is if Tata-DoCoMo or for that matter other operators striking a handset bundling programme to have a first mover advantage in India with Mango. Although with Android mania all around, one will have to reserve a judgement on how keen consumers will be to lap onto a product like IS12T. One cannot just dismiss the new smartphone OS either with new mobile phones with Windows Phone 7.5 (like HTC Eternity) expected to launched in India in the coming months.